Toys are important for your 6 month old baby. Let me tell you about a typical day in our 6 month old baby’s life. Baby wakes up fussing. It’s not his fault- daddy used to get up at 5.30am to prepare for work so our 6 month old baby has gotten used to this time schedule. It doesn’t matter that I (mommy) and daddy are not up yet today. It doesn’t even matter that I am exhausted because the baby was up every hour until 11 pm the night before and then, every 2 hours after that because of teething. What matters is that baby is now up. I try to ignore the crying and hope that baby will go back to sleep. Fat chance of that. Baby’s fussing increases in intensity until it becomes full-blown crying. I entertain the thought of dragging myself up from bed in my sleep-deprived mind. But the desire for sleep wins. ‘No, let baby learn to put himself to sleep- that’s what the experts keep saying. Let baby learn to fall asleep on his own again.’ I think to myself and remain motionless and quiet under the bedsheets, silently praying that baby will also agree with the experts. No way. Baby’s crying now becomes loud, screaming howling that echoes through the house. Even daddy cannot ignore them, even though he sleeps much deeper than me. Daddy, the dependable warrior that he is, forces himself out of bed and dutifully picks the baby up. The crying temporarily stops but we both know that baby wants mommy, not daddy. So daddy thinks quickly. He knows he has to distract baby immediately before baby realizes that it’s him, not mommy. Daddy grabs the nearest toy he can find, the Cloud b Sound Machine Soother, Sleep Sheep. The Sleep Sheep goes to bed with the baby every night in his crib. It’s one of the few toys that I will allow into baby’s crib because it is safe and small enough that it wouldn’t pose a sleeping hazard to baby’s breathing. 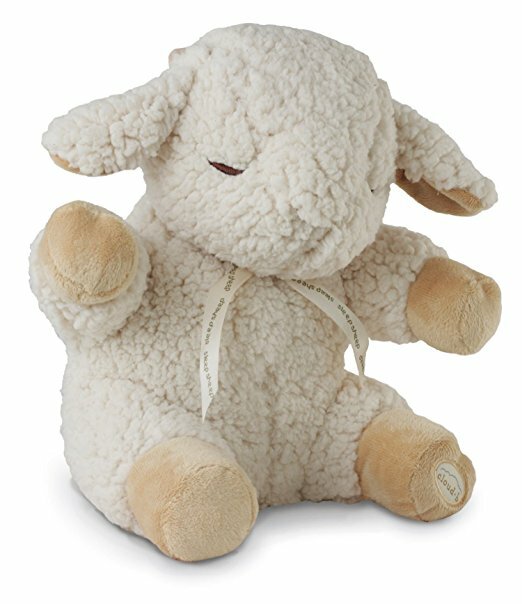 On top of that, the Sleep Sheep can produce white noise which is magical for helping baby sleep better. We would be doomed without the white noise. We now take the Sleep Sheep on holiday with us because it helps baby adjust in a new environment and is small and light enough to fit into an overpacked suitcase. Baby seems happy to see the Sleep Sheep, reaches out for it and is temporarily distracted. Daddy realizes that now is the time for him to make a quick getaway with the baby and carries him out of the room to give mommy an extra 30 minutes of sleep. Such is the life of a mom, 30 minutes of extra sleep is a luxury (to read about life as a mom of a newborn, see our best toys for a newborn post). Daddy heads into the kitchen with the baby to make breakfast and plops baby into the Fisher-Price Sit-Me-Up Floor Seat with Tray. Baby loves the Floor Seat because it allows him to stay up and see what is happening around him. Daddy loves the Floor Seat because it keeps the baby quiet. Everyone wins. 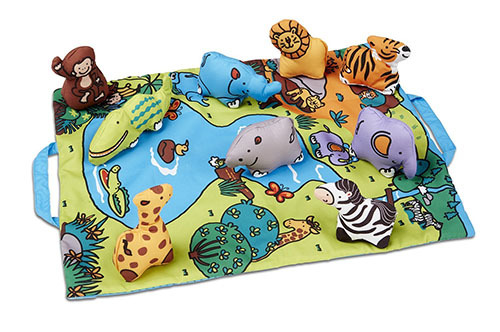 Daddy is smart enough to place some animals from the Melissa & Doug Take-Along Folding Wild Safari Play Mat with Toys onto baby’s Floor Seat tray so that baby can entertain himself. The Melissa & Doug Wild Safari Toys are particularly great because they are made up of different jungle animals that make sounds; whether a rattle sound, crinkly sound or squeaky sound. Baby really likes the crinkly ones especially. While making breakfast, daddy talks about what he is doing so that baby doesn’t feel he is being ignored. When daddy is finished approximately 30 minutes later, baby now realizes he is hungry and even the toys in front of him will no longer make him happy. Baby starts fussing. Daddy notices this and knows that this is baby’s cue to him that it’s time to bring him back to mommy before he has a full meltdown. Luckily for me, I fully used my precious extra 30 minutes and caught up on much-needed sleep. favorite food is milk although he is also starting solids now. Although he hasn’t fully rejected the food that we give him, I have noticed that baby doesn’t really like how the food feels on his tongue. 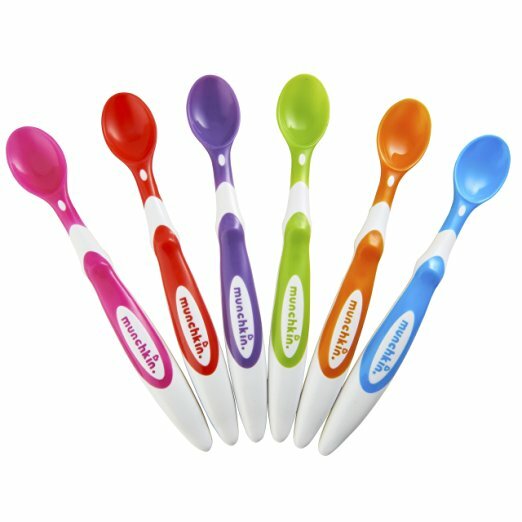 He does like playing with the Munchkin Soft-Tip Infant Spoons that I use to feed him, though. Baby is always happier after sleep and food and after I finish feeding him, I know that this is my golden opportunity to quickly brush my teeth and take a shower before baby gets tired and grumpy. I have learned to brush my teeth, wash my hair, shower and dress in under 20 minutes since I became a mom. Long gone are the days where I used to take long showers! 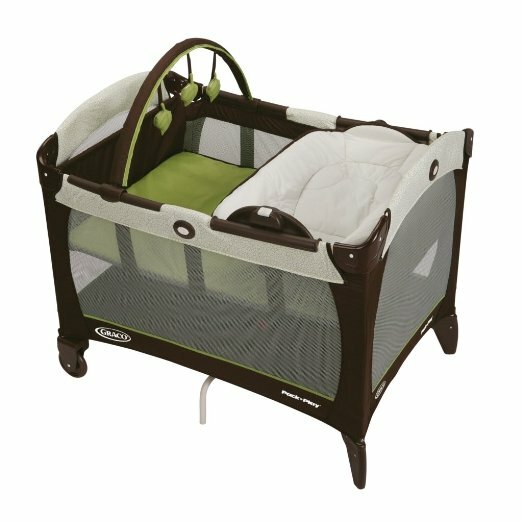 So realizing that I have limited time, I quickly plop him in his Graco Pack ‘n Play Playard with Reversible Napper and Changer to play for a little while so that I can quickly get ready for the day. Daddy has already left for work so I know that I will now have to look after the baby on my own with no help. Over the months, I have worked out a system of using different toys to keep baby distracted so that I can get things done in the house. One important tool is the Playard. Baby loves grabbing the dangling toys from the Playard. The Playard is particularly cool in that I can adjust the toy bar higher or lower to suit whether the baby is on tummy time or sitting up. I also love that I can leave the baby to play in it safely on his own. The dangling toys will disconnect if pulled hard so it doesn’t present any strangling hazard (not that the string is long enough anyway) and the walls are made of mesh and soft so that baby cannot hurt himself if he were to lose his balance and fall backward. 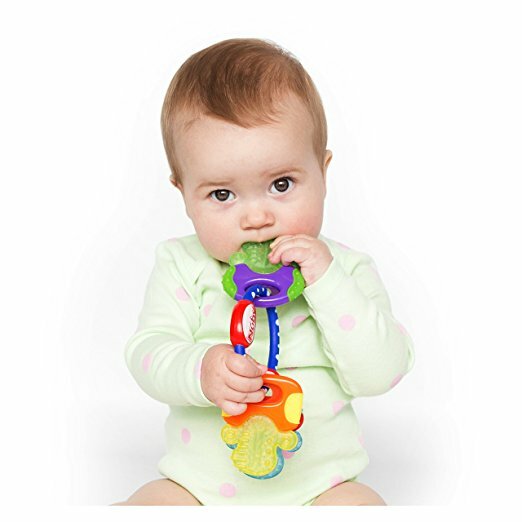 I also pop baby’s Nuby Icybite Hard/Soft Teething Keys in the Playard so that he has something to chew on in case his teething pains start while I am still in the bathroom. I really appreciate the Teething Keys because baby loves chewing on them! They are also suitable to be placed in the freezer. It’s one of the few things that I trust the baby to put in his mouth. When I am done and return back to baby, baby grins and kicks happily to see me. Although he does enjoy playing with his Sleep Sheep, Melissa & Doug Wild Safari Toys and Nuby Icybite Hard/Soft Teething Keys in his Playard, playing with mommy is still his favorite activity. I pick the baby up and head towards the living room which has been transformed into a toy room since the baby was born. In all honesty, the house really looks like it belongs to the baby more than mommy and daddy. When you observe every room, it looks like a baby moved in, took over the house and only left a few spaces for mommy and daddy. But that’s fine, I kind of like it that way. I place baby on his belly for tummy time on his ABC Foam Mat. 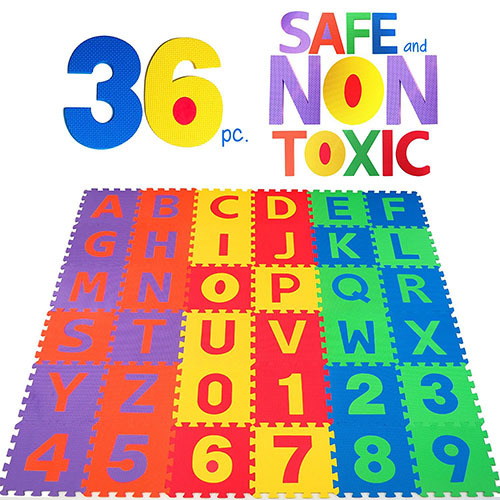 It’s colorful, easy to clean and provides a huge space for baby to lie on. Now that baby is teething, I especially appreciate that I don’t have to worry about drool all over my carpet. 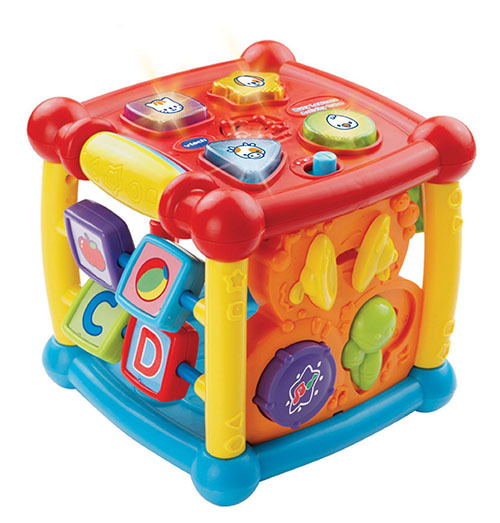 To provide baby with more stimulation, I push his VTech Activity Cube towards him so that he can play. 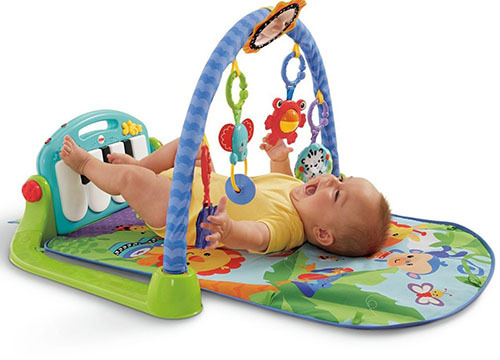 It’s a fun toy with a variety of moving shapes and things to touch on all sides. He plays happily by himself for 10 minutes but then fusses for me to come to him. I join him as I know how important it is for baby to have human interaction during play time while his brain is still developing. We play with the Activity Cube together for a little while but eventually, baby gets bored. I expect this because young babies don’t have a long attention span. I ask the baby if he would like me to read some of his favorite books to him. He smiles happily so I read First 100 Animals and sing his VTech Rhyme and Discover Book to him. I am convinced that baby is starting to recognize the names of the animals. I also enjoy the music accompaniment while I sing the rhymes from the Rhyme Book. It makes reading time more fun for me. I think baby enjoys it more too. I absolutely love spending time with my baby but in the back of my mind, I know that I have to get back to my article writing as I work from home. It’s a fine art to balance work and parenting and I think it’s especially challenging when you work from home. Strategies and toys are essential. I have to constantly think of new ways to engage baby so that I can get work done. sarily want our babies to be piano virtuosos but who wouldn’t want their baby to have some musical skills? Secondly, baby genuinely does enjoy kicking and listening to the music that it plays. The songs are not annoying as well which is helpful if you are forced to listen to the same tune for the 50th time. If I am lucky that piano can buy me 20 minutes of time to work. Today, I am not so lucky. Baby wants to see what I am doing. 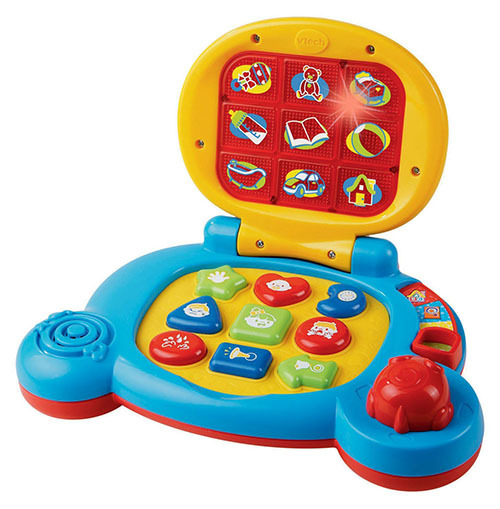 Instead of showing baby my computer screen (which is not recommended or should be limited), I hand baby his own VTech-Baby’s-Learning-Laptop. It’s cute, plays sounds and looks similar to what I am doing so it pacifies baby for a little bit. In the afternoon, it’s time for baby’s bath. I put out the Bath-Tub-Rainforest-Friends, fill it warm water and place baby in it. I also add the Munchkin-Float-and-Play-Bubbles-Bath-Toys so that baby can play with them. They certainly make bath time more interesting for baby while I soap him. I especially like these Bath Toys because they are non-toxic and don’t have a risk of mold growing in them. I used to have bath toys that squirted water for the baby until I read that many of them end up with dangerous mold in them. The unfortunate thing is that the mold is almost impossible to prevent if you use the toys regularly and you can’t clean them inside. The rest of the day is a blur between feeding baby, changing baby, helping baby to nap and work. I interchange the toys around so that baby gets a bit of a variety. By the end of the day, I am exhausted but I have survived another day as a parent and done my best. In my mind, that’s all we can do, just do our best and love our babies to bits. 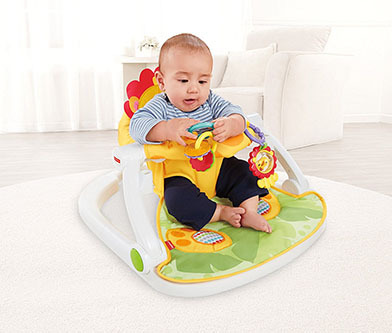 To read more about 3 to 6 month old babies, see our previous post on Best Toys for 3-6 Month Old Babies.